I'm using Perlite as aquarium filtration material. 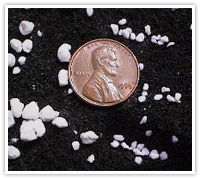 Perlite is the white, light weight material that's added to potting soil. Perlite has a very high surface area. It would seem to offer great possibilities for either mechanical or biological filtration. Another plus, for freshwater systems at any rate, when the Perlite needs to be changed, it could be immediately reused as soil for house or garden plants. As an aside, when doing water changes, water from the aquarium is a great source of fertilizer for plants. Perlite is available in three grades: fine, medium, and coarse. The fine is a powder with the appearance of flour. 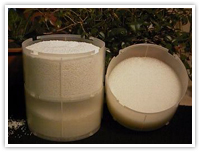 Fine Perlite can be used instead of Diatomaceous Earth in a Diatomaceous Earth filter. The medium grade is twice or three times the size of grains of sand. The coarse grade is about the same size as gravel. 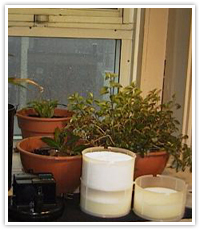 The coarse grade is what's generally used with house plants. I set up a tank using the medium grade of Perlite in a fluvial brand aquarium filter. It's distributed by the Hagen Company of Canada Hagen Company of Canada See: (www.hagen.com) . With the relatively fine grade of Perlite, it was necessary to sandwich the material between sponges. This was easy, for the filter is designed with three chambers for this very reason. Peat moss is often used in the center chamber. The next morning, the water was crystal clear. I placed a dozen Blind Cave Characins in the tank the following day. The fish are extremely active and are doing very well. Their appetites are phenomenal. The water remains crystal clear. To give the Perlite a thorough test, I next set up a fifty gallon aquarium with oscars. I continued to use the large Fluvial filter with the Oscars. A smaller Fluvial went to work on the Blind Cave Characin tank. I'm now using the coarse grade of Perlite in the middle cartridge. The medium grade continues to serve in the top and bottom cartridges with the sponges retaining the Perlite within the cartridges. I've found the Perlite to be great for both biological and mechanical filtration. It really cleans and polishes the water. Before you put the Perlite in the filter, rinse it out in a net under the tap. If this isn't done, the filter will, at first, give a milky output. This doesn't seem to bother the fish and the filter will quickly clear the cloud of Perlite dust. Since it's so easy to avoid, you might as well do so with a quick rinse of tap water. Another great application of Perlite would be in a pond filter. The spent material would be a great way to fortify the earth in the surrounding garden.